Today’s case highlights a condition that was fairly common in the late-19th and early-20th centuries, although it’s not very well known today: tuberculosis, but not as you might expect. It’s easy to think of tuberculosis as purely a lung disease, but in some cases the infection can affect other areas of the body instead. Children’s files in the archive give us examples of tuberculosis in the digestive system, the nervous system, and scrofula (being tuberculosis in the lymph glands in the neck). One of the most common tubercular diseases we’ve found, after tuberculosis in the lungs, is tuberculosis affecting the bones and joints. Often this type of infection occurred after an injury or breakage, with tuberculosis developing in the damaged bone. Grace was living in Dinas Home For Girls in Brecon, Powys (then in Brecknockshire), when it was taken over by The Children’s Society (then known as the Waifs and Strays Society) in 1909. At this time, Grace would have been 12 years old. She was from London and had entered Dinas home through another charity, the Fulham branch of the Rescue Society, after her parents had separated. Her father had been described as “very unsteady”, with Grace and her three siblings having been neglected when under his care. While in the Dinas Home, an abscess was found on Grace’s hand, which was identified as being the result of tuberculosis. In early 1911, with Grace around the age of 13, she had an operation to remove the abscess and was then sent to the coast for a month to recuperate. Unfortunately, the operation wasn’t as successful as had been hoped; by December another abscess had appeared on Grace’s wrist. Grace was seen by a doctor, who recommended that her hand should be bandaged up and that she should be given complete rest and sea air. Because of this recommendation, Grace was sent to The Children’s Society’s new convalescent home, St David’s Home in Broadstairs, Kent. In St David’s Home, Grace could receive the medical care she needed. Her hand and wrist were treated with poultices and with boracic lotion, which was an antiseptic. Grace was also found to be suffering from head lice, which was treated with sassafras. These treatments seemed to be successful and, in time, the abscess started to clear up and the swelling on Grace’s wrist went down. After three months in St David’s Home, Grace was transferred to St Audrey’s Home in Bedford. When she arrived at St Audrey’s Home, it was found that Grace was not able to use her hands much. The healed abscess on her right wrist had left it swollen and weak, while the doctor at the home found that she also had a “poisoned” finger on her left hand. After enquiries it was found that just before Grace had left St David’s Home she had pinched her finger in an accident. It was thought that underlying tuberculosis might have caused Grace’s injured finger to go bad. As it had been discovered that Grace was still suffering from tuberculosis, she quickly returned to St David’s Home in Broadstairs for further treatment. By September 1912, having been in St David’s Home for a further four months, Grace was described as having put on weight and being in good health. She was now 15 years old and it was thought best to send her to a home where she could start to learn a trade to allow her to go to work when she was well enough. In October, Grace was sent to St Barnabas’ Home in Newark, Lincolnshire. She didn’t remain in this home for long, however. By January the next year, the doctor at the home had sent on a medical certificate saying that Grace was still suffering from tuberculosis in her wrist, with the disease now in an active state. to Mr. Boyd, 134 Harley St W, to meet Dr. The x-ray must have shown signs of tuberculosis because it wasn’t long before Grace returned to Charing Cross Hospital to have an operation on her wrist. 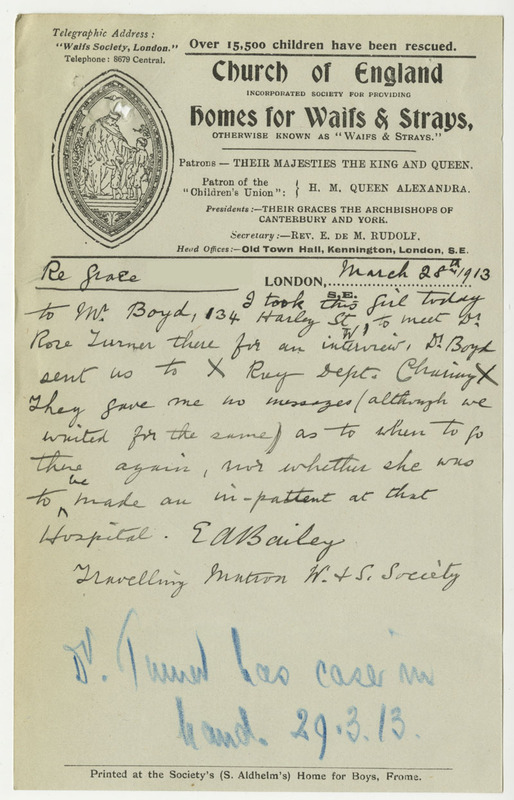 After this she would need extra medical care while recuperating, but the active condition of the tuberculosis meant that she couldn’t return to St David’s Convalescent Home in Broadstairs where the children there, already ill, might be put at further risk of infection. Instead, in April 1913, Grace was transferred to the Westminster Union Infirmary in Lincoln’s Inn Fields, London and then to the Strand Union Infirmary in Edmonton, London. Here it is said that Grace was staying in a small ward and that “… the Doctor has ordered her special diet, extra milk &c [etcetera]”. When visited by one of The Children’s Society’s travelling matrons, Grace was found to be doing well, with her wrist weak but healed up. This is all we hear about Grace until November 1913. By this point we find that she had been transferred to the Isolation Hospital in Ramsgate, Kent, but there are no updates as to her condition. With no further correspondence in Grace’s file, we can only guess at how she was doing. The operation on her wrist may perhaps have healed, but the fact that she was still in hospital suggests that her tuberculosis hadn’t cleared up completely and was potentially still active. The prognosis for Grace, then, didn’t look good, and without the option of the antibiotics we have today, it seems like further surgery may have been Grace’s only hope. 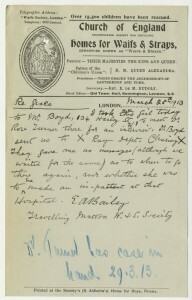 As sad as it is, Grace’s file gives us some interesting information about medical treatments in the early-20th Century. We find out that boracic lotion was used as an antiseptic and that sassafras was used to treat head lice. Not to mention, we have evidence of x-rays being used as a tool for diagnosis, and this only 18 years after x-rays had first been discovered. Most importantly, Grace’s file shows us what it would have been like to live with a tubercular infection in the joints and bones. This was a disabling condition that left Grace living in convalescent homes and hospitals, unable to continue the training she had started. Even invasive surgical treatment, it seems, wasn’t able to stop the infection fully, leaving potential for the disease to return and spread to other parts of the body. Thanks, Laurel. I’m glad you found it interesting.